Koh Phi Phi is a small island in the Krabi region of southern Thailand. 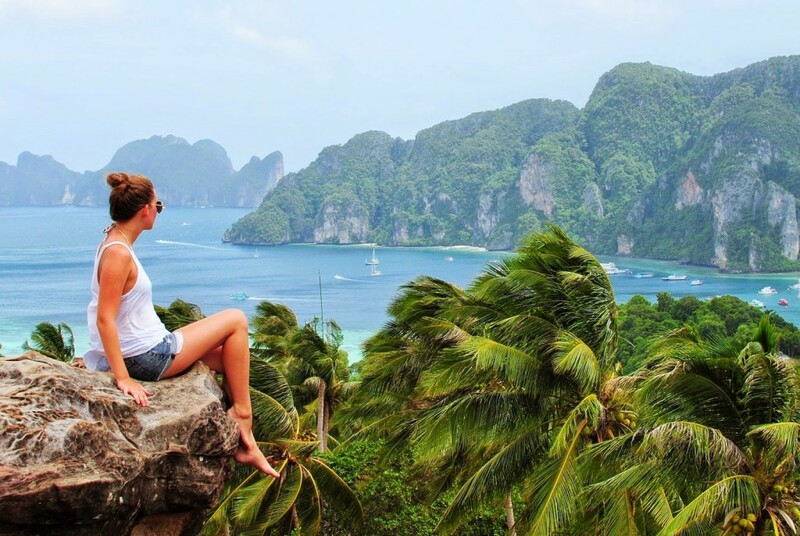 It actually consists of six tiny islands, the most popular two being Phi Phi Leh and Koh Phi Phi Don. Phi Phi Leh is the smaller of the two and uninhabited while Phi Phi Don is a little bit bigger than its counterpart and is the island where everyone stays. Phi Phi Don quickly became a favorite when we discovered that rather than roads the island is paved with cobbled pathways and the general mode of transportation is bicycles. This doesn’t stop the locals from swarming you red carpet style when you’re ferry arrives yelling “taxi, taxi!” They do not in fact offer taxis in the way you might be thinking, but rather will dump all your luggage into a cart and push it down the paths to your accommodations. Luckily, with our backpacks we didn’t have an issue getting our luggage around town. The town is small and is sandwiched between two beautiful beaches. One is more popular for partying while the other (the one on the same side as the ferry) is quieter and used mostly for docking boats. Although small, there is quite a bit to do here and some, like us, end up staying much longer than originally planned. We were lucky enough to stumble into a friendly expat working at a diving shop who recommended a few good places to eat around the island. After that we quickly developed favorites and acquired even more great recommendations. When eating we stick to really good food or cheap fast eats and here you will find a mix of both. Papaya was our absolute favorite and it offered cheap, authentic Thai food. They actually have two locations, but the one near the Rolling Stones Bar is the original place. 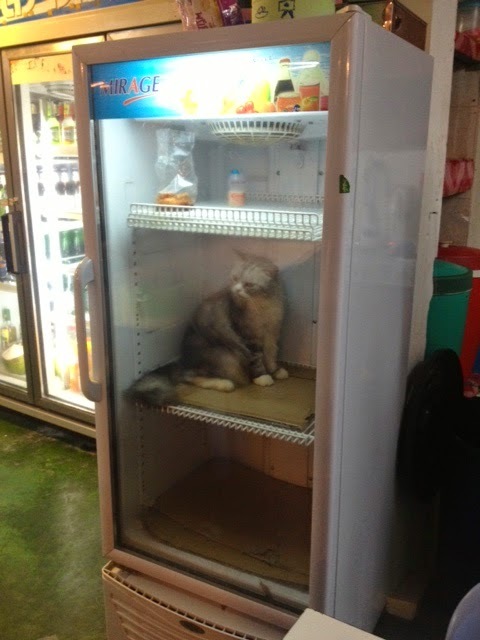 The walls are plastered with customer testimonies, love notes to fridge cat and food recommendations. We actually made all of our choices based on these recs and were not disappointed. 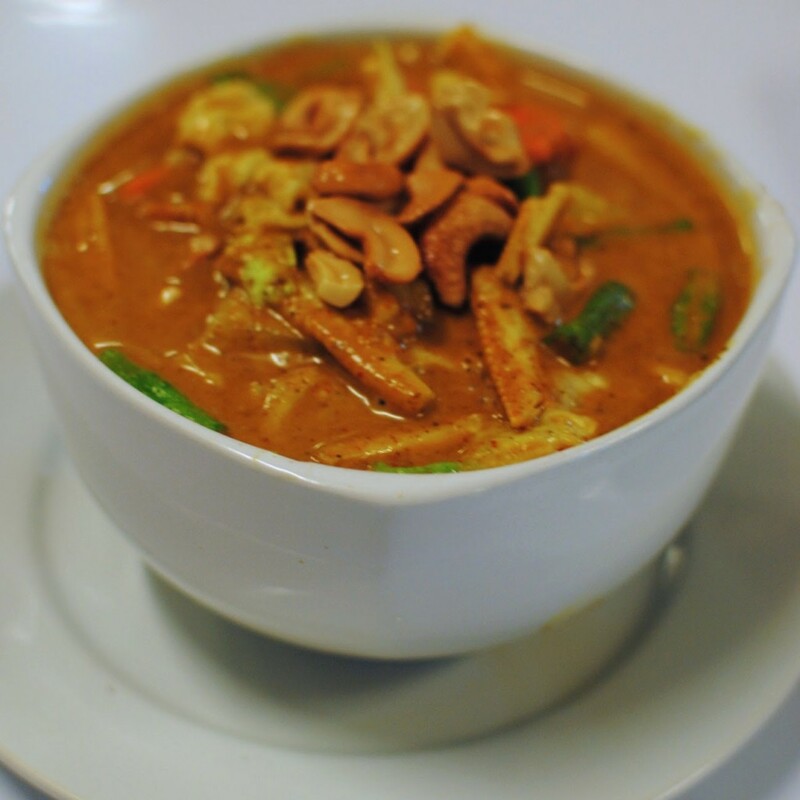 The curries were literally so good that we went 3 days in a row so we could try each!! 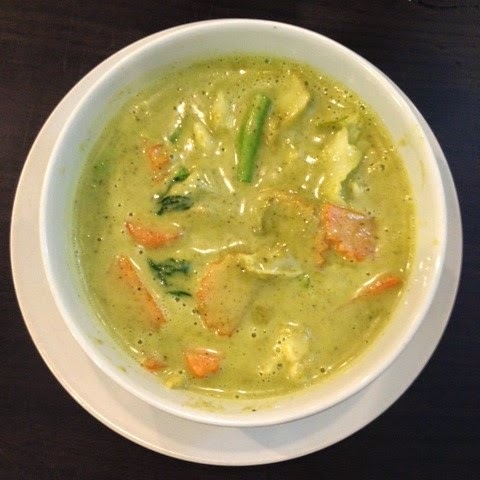 The green curry was my favorite, masaman was a close second. Indicate the spice level you want using percentages. We were all about 80% spicy. The pad thai and other fare were also great, of course. When you just can’t kick your craving for Mexican food, head over to Banana Bar. It is not as good as some of the Mexican I’ve had back home but the tortillas are actually tortillas and the chips are actually chips. Skip on sour cream since it is just not the same and the margaritas are a bit too heavy on the sour mix. Do order a Mexican pizza, nachos or a fajita. And go at happy hour for the best prices. Fruit shakes quickly turned into a staple meal for me on this island. It’s just so much easier to maximize beach time when you can tote your food right down to the water. And these smoothies were good (and cheap)!! We loved the lady across from Banana Bar but there are many along the main paths. I really liked watermelon strawberry in the middle of a hot day and got banana mango smoothies at breakfast. Maggie ordered a coffee smoothie that was delicious. When you just can’t pull yourself too far from the beach or maybe stayed down there too long and need a fast, cheap snack you don’t have to look any farther than the beach entrance. Along this path you can find fried spring rolls, chicken, french fries, samosas, pizza and more. Plates are cheap at around 50 baht and this area appropriately doubles as the drunk eats spot at night when the beach turns into a dance club. Drinks around town are quite expensive and will quickly rack up a bill. Instead head outside onto the streets and take a walk around. The costs of the buckets vary but they are so much cheaper than bar drinks and served in bucket-sized proportions. These drinks are quite strong too so you can save even more money and share. We also got quite a few other restaurant recommendations from other travelers including ORANGE PLACE for great Thai food, MATT’S GRILL for all you can eat BBQ at just 150 baht ($5) and ANNA’S for a really good quality meal. 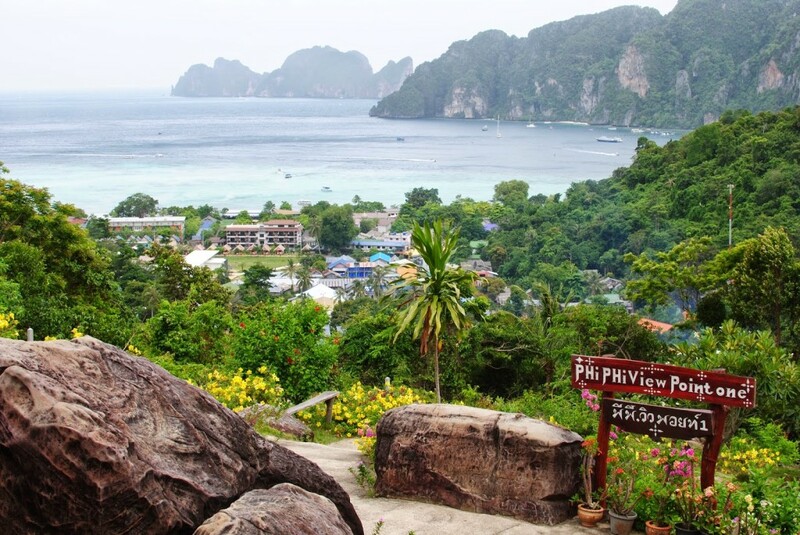 One of the first things you should do after arriving to Koh Phi Phi is visit the viewpoint. Drop off your bags and change into something comfortable because the walk up the stairs becomes quite a hike. 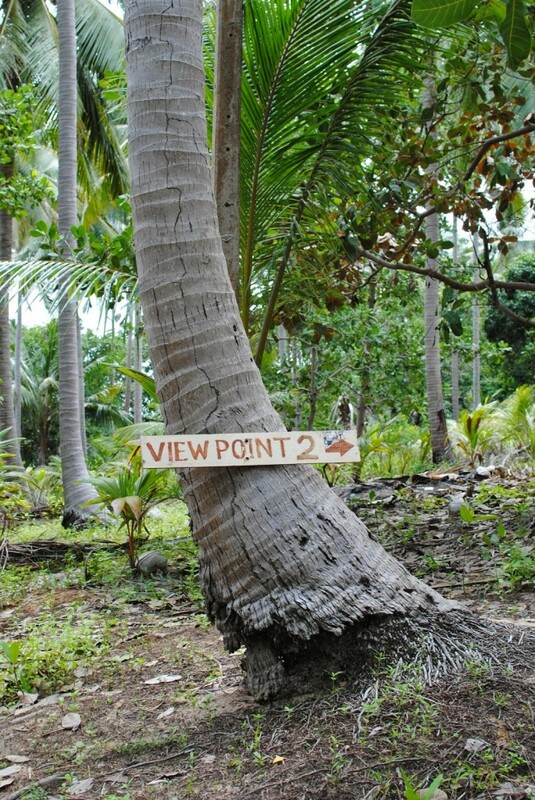 Make sure you have a map or follow the signs posted for the viewpoint. Once you walk to the end of town you will arrive at the bottom of these glorious stairs. From here you can’t get lost, just keep climbing up. The entrance fee at the top is 20 baht. Head to view point one but don’t stay too long because the real view is the second one. 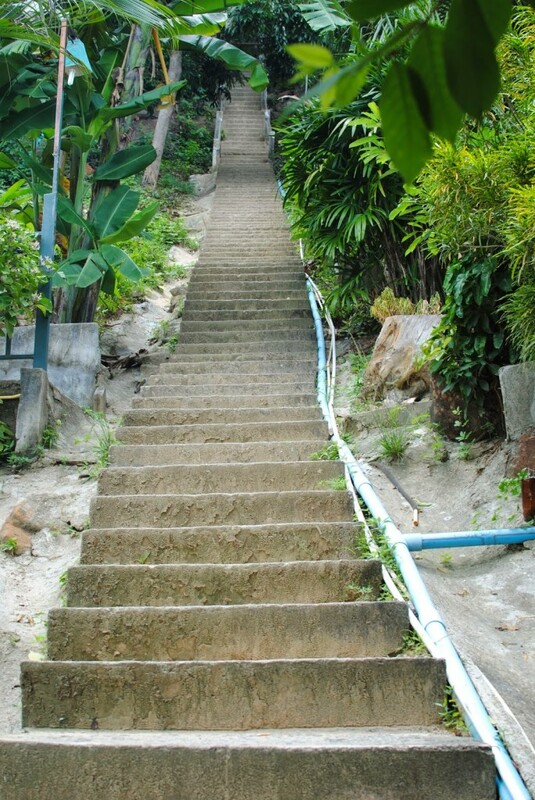 There are no more stairs but you will find yourself climbing up some pretty steep paths. As you get higher it will cool down and all this work is worth the view for sure. At the top you get a great view of the island that is not only beautiful but useful in getting a feel for your way around. It’s amazing how the town is sandwiched in a tiny slice of land between those two bays. The beach on the left is the pier side and the one on the right is the party side. There are actually two monkey beaches and since I only visited one I cannot tell you the difference. The beach I saw was small and a bit littered because the monkeys tend to beg, borrow and steal any food or shiny objects they can grab off of visitor’s boats. If possible I suggest going with a small group so you don’t have to watch hoards of dumb visitors taunt the monkeys and can simply enjoy their little beach instead. These two islands are a short boat ride from Phi Phi Don. Bamboo Island has a 100 baht entrance fee but is one of the most stunning beaches I have ever seen. The water is a bright turquoise that is so clear you can see right down to the white sand and the water is actually deep and cool unlike the shallow bath water on Phi Phi Don. Mosquito Island, or Mojito Island as we prefer to call it in our faux Thai accents, is a nice stop for snorkeling. Maya Bay became famous after they filmed “The Beach” there. 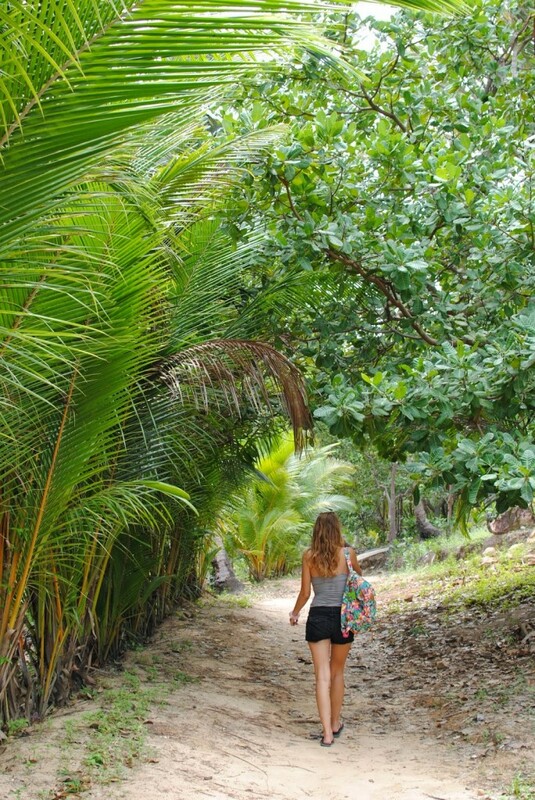 It is difficult to access making it a beautiful untouched jungle (despite the boat loads of tourists that get dropped off throughout the day). It really is surreal and worth the effort it takes to swim, climb and hike your way there. Around town you can easily find a tourist shop on every corner. Look around to compare prices and then book a half or full day Maya Bay tour. The great thing is that these tours include majority of the things I’ve recommended you to see – Monkey Beach, Mosquito Island, Bamboo Island and Maya Bay – and also include snorkeling! It’s a one stop shop for exploring the island. And remember that tours in Southeast Asia tend to come with a few language barriers and timing issues but just enjoy your fun packed day as it comes… it’s worth it! There are quite a few spots to snorkel around the island and you should give it a try, especially if you book a Maya Bay tour. My favorite spot was off of Phi Phi Leh. Scuba Diving is definitely available as well given the number of dive shops around town, but I hear it’s not worth the price during rainy season due to low visibility. Head down to Loh Dalum Bay, set up your towel and head into the water. It’s shallow and warm but a fun spot for socializing. We ran into travel buddies we had previously met and made new friends. There are a few quieter beaches around the other side of the island as well if that’s what you prefer. Phi Phi Don has a lot going on at night. The BANANA BAR has a rooftop bar equipped with projector screens for movies and tables for games, the IRISH BAR is always bumping and CARLITO’S has a fire show at 9:30. On the streets you will find cheap bucket stands while the beach is lined with bars that turn into dance clubs spilling out onto the sand. Looking for a place to stay? We tried out the Marine House and Harmony House. The Marine House was conveniently located just a few blocks past the pier but a little on the pricey side for a hostel. Harmony House along with a few other really cheap options are located along the path on the way to the viewpoint. If you’re looking for something a bit more luxurious then staying in Phuket might be the better idea, on the northwestern side in a private cove there is a fabulous resort called the Trisara, many people say that the Trisara is Heaven on Earth, the resort is beautiful and so are the views, it has everything you could possibly want and is very private, you can even have a suite with your own private pool if you should choose to. 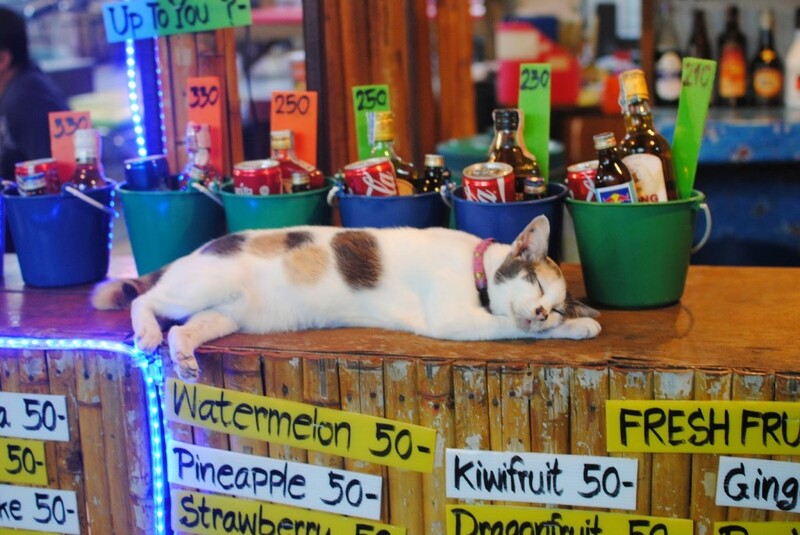 How to get to Koh Phi Phi? Just purchase a ferry ticket from a tourist shop in Krabi or Phuket. Make sure to ask whether your ticket includes transport to the pier. The ferry should take a few hours and will drop you off at Phi Phi Don’s only pier which is a short walk from any part of the main town. Entrance onto the island should be 20 baht.